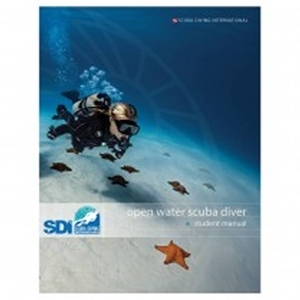 THE SDI OPEN WATER DIVER STUDENT MANUAL IS THE TEXT-BOOK LITERARY ASSISTANT TO THE SDI OPEN WATER DIVER CERTIFICATION COURSE. By signing up for this course, the respective student has taken the first step to becoming a certified scuba diver. This manual details diving history, oceanography, marine life, the physics and physiology behind the sport of diving, scuba diving equipment, as well as an in-depth training of basic scuba diving skills and techniques. This is a full colour, glossy format product.